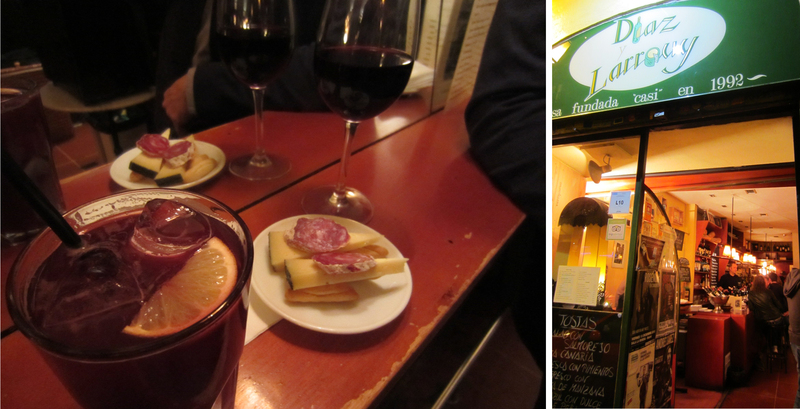 Hands down one of the most visually exciting tapas experiences we had in Madrid was at Txakolina. It’s located south of Plaza Mayor on one of my favorite streets for nightlife, Calle Cava Baja, which draws its name from the nearby access “caves” that used to occupy the La Latina area. This neighborhood is one of the most popular spots for a tapas crawl, and for good reason, with one great bar after another as you make your way down the narrow street. This Pintxoteca Madrileña specializes in Basque-style pintxos, which comes from the verb pinchar meaning to pierce, hence the toothpicks that anchor these artful creations. These larger portion tapas are displayed along the bar, so you know what you are getting (vs. ordering blindly off a menu), making for an easier experience for the tapas novice. With so many tempting options to choose from, it may be hard to make a decision (we went with 2 pintxos, one with brie and caramelized onions and another stack of fried eggplant). When you’ve made up your mind, tell one of the bartenders what you want and they’ll heat it up for you. The prices are a little higher at Txakolina, but it’s worth it given the portion sizes, selection and great ambiance. Come early because it’s sure to fill up as the night progresses. 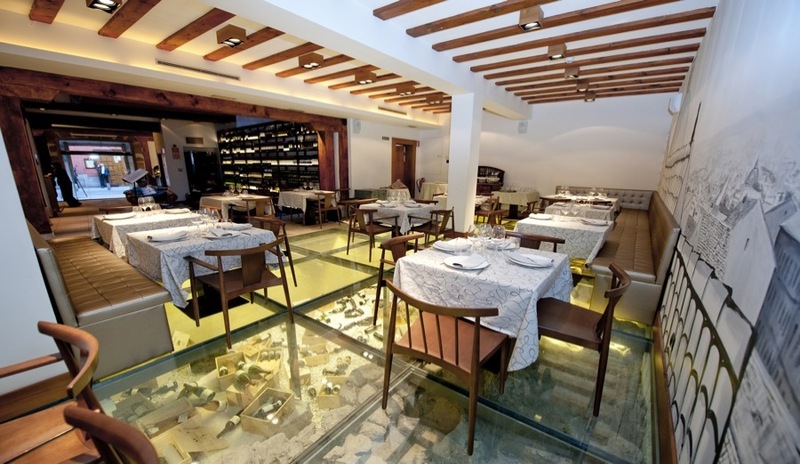 Also on Calle Cava Baja, this 17-room hotel is home to the Enotaberna restaurant and wine bar on the ground floor. While the restaurant has a more upscale feel, the casual bar area is a great place to stop in and linger over a drink or two. 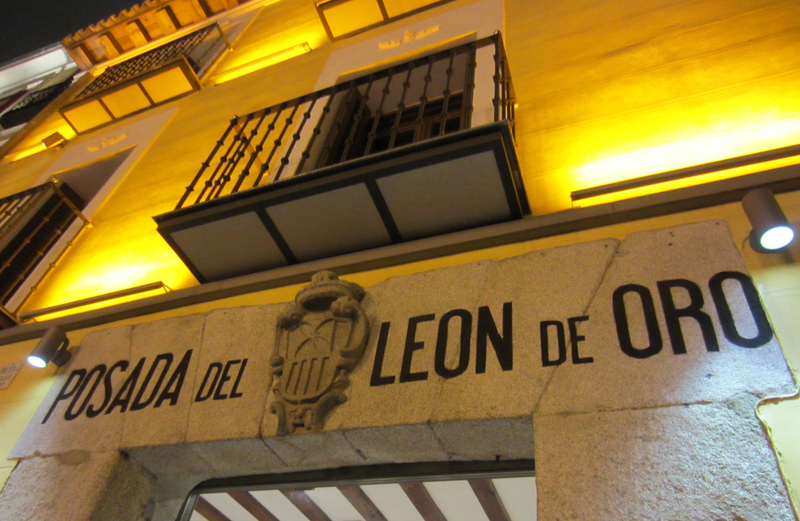 León de Oro’s menu boasts more than 300 varieties of good wine at good prices, as well as a decent selection of tapas. Notice the glass floor panels when you walk in, which reveal the remains of the 12th century stone wall that used to encircle the city. All around a great stop on our tapas tour, we even returned a second night. 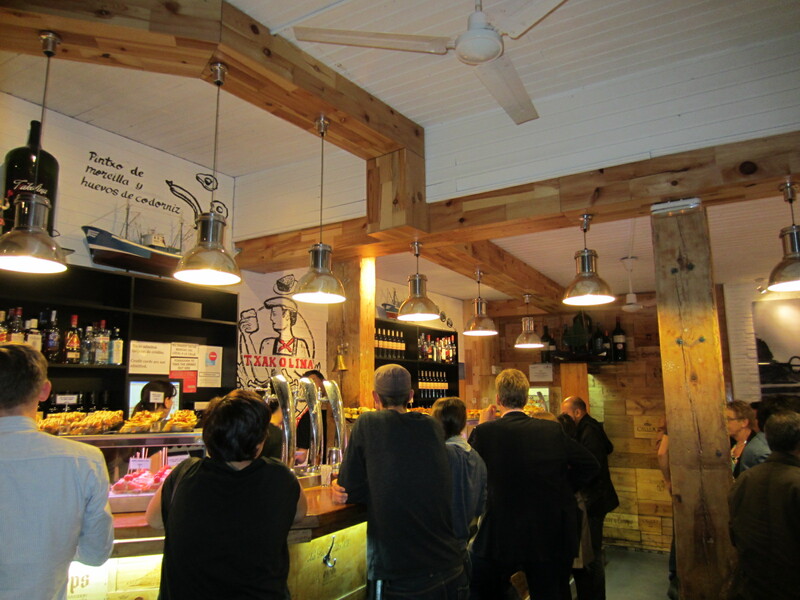 Continuing up Calle Cava Baja, Diaz y Larrouy is a more cozy and intimate bar with a local vibe. The narrow space is flanked with a bar on one side and stools along a mirrored wall on the other, giving the appearance that the place larger than it really is. The night we went to Diaz y Larrouy, there was only one bartender running the entire place, but he worked fast to ensure all of his customers were appropriately imbibed, never missing a beat. While we skipped ordering from the menu of tostas written in chalk on the wall, the small plate of Manchego cheese, meat and breadsticks that accompanied our drinks was the perfect complement. No trip to Spain is complete without indulging in the obligatory chocolate con churros, and in Madrid treat yourself to the best of the best at San Ginés. 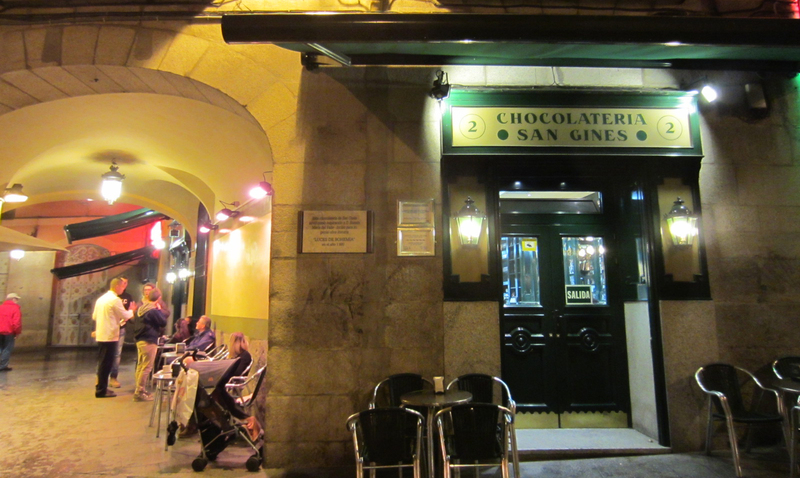 Located down a dim side street off of Calle Mayor, this chocolatería has been a local institution since 1894 and is open 24 hours a day, every day. By contrast, the bright white interior is anchored by an elegant marble bar, and the walls are covered with photos of celebrities who have paid homage to the chocolate mecca. 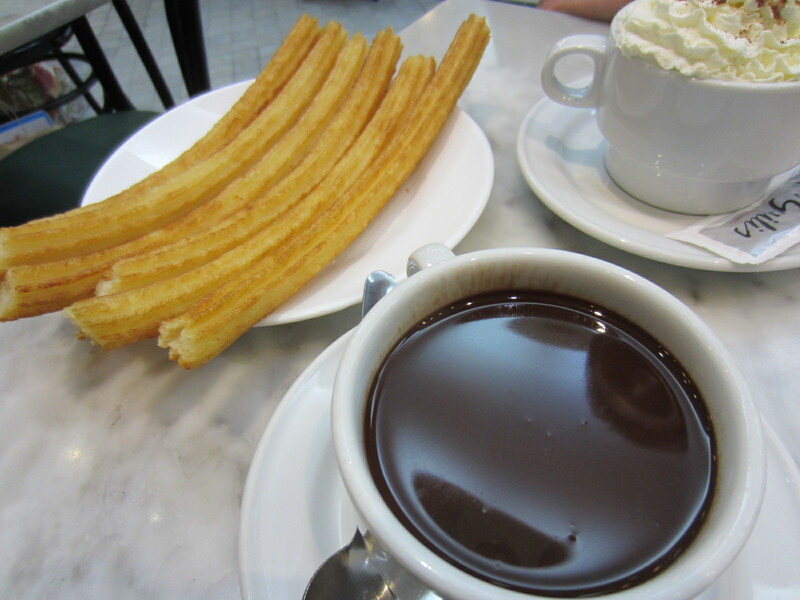 Blurring the lines between a nightcap after tapas bar hopping and a traditional breakfast for locals, chocolate con churros is actually quite simple in concept – una taza of thick, pudding-like hot chocolate served with half a dozen warm churros, which are made fresh before your eyes at San Ginés. Dip. Enjoy. Repeat. 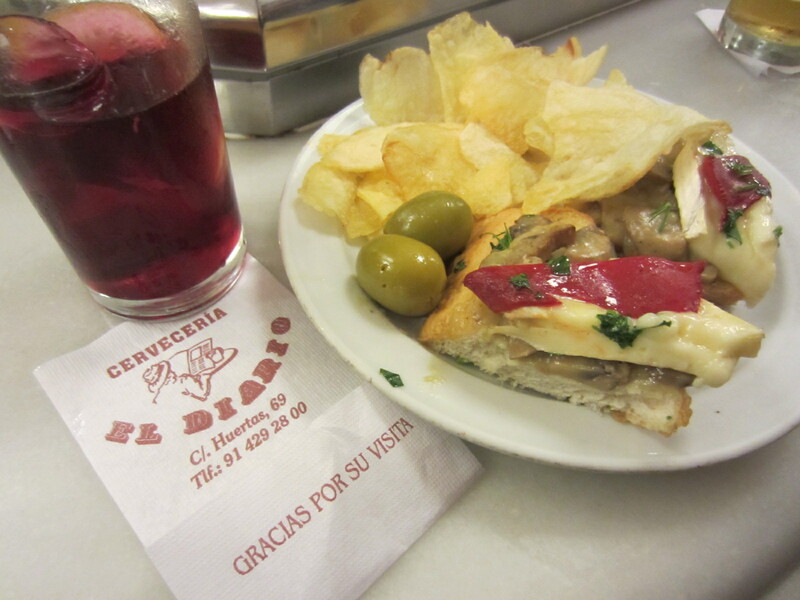 Across town, El Diario anchors the corner of Calle de Las Huertas and Calle de Jesús, another amazing area for tapas in Madrid (see the link at the bottom of this post). Founded more than 130 years ago in 1879, this taberna and cervecería has both a sit down dining room and a lively bar area that tends to fill up quickly (it was standing room only by the time we left). The menu is posted around the exterior of the building, so you can get a preview of the restaurant’s good variety of meats, cheese, salads, signature seafood and other larger dishes. If you’re up for lighter fare, snag a seat at the bar, order una cerveza or tinto de verano and choose from the many tapas on display.